For tens of millions of people around the globe who suffer from acid reflux, this is a common occurrence that causes not only severe discomfort, but also heightening pain which if left untreated, can lead to serious health problems. Sadly, though, many of those who suffer from acid reflux don’t seek medical treatment, they just take the pain and discomfort silently and just hope that it goes away. And the main reason for this kind of attitude is that because they don’t precisely know what causes Acid Reflux, so they just take it lightly. Acid reflux is curable and preventable. But because there are different causes of acid reflux, the solution will vary from one affected person to another. So, it is better to first get a good grasp of what causes Acid Reflux before it gets worse to be able to understand the factors which may affect you, and prevent it from happening or getting worse. Some of the more common causes Acid Reflux are due to high levels of acidity in the food and drinks ingested by the body, a weak lower oesophageal sphincter or LES, irregularities to the oesophagus, and abnormalities in the regular function of the stomach or digestive system. Any of these causes occur due to several factors as well. In the first case, high acid intake would of course increase the acid levels in the stomach allowing it to reflux to the oesophagus. Avoid fatty foods, tomato sauces, fruits like apples and oranges, vinegar, highly caffeinated products, and alcoholic drinks if frequently experiencing acid reflux. In the second case, a weakened LES can be caused by smoking, drugs, and an unhealthy diet, especially one with high salt content. Frequent exposure to acid also helps to weaken the LES. IF the LES remains weak, it will be unable to stop acid from leaking out. With problems in the oesophagus, there can be varying reasons why. But to illustrate further, acid reflux occurring due to a problematic oesophagus happens when the oesophagus is unable to help ingested food to flow freely to the stomach. Usually, when food is swallowed and it lacks enough momentum to push all the way down, the oesophagus creates a waving motion pushing the food down. For some people though, this motion is not created causing acid reflux. And lastly, and also an acid reflux cause factor that happens only to a small group of people, the stomach has abnormalities in its digestive function. It doesn’t digest the food at the common and normal amount of time as to most people and takes longer to empty itself out. This allows more acid to leave the stomach because they are not broken down by our digestion process, allowing it to reflux. Reflux, derived from the Latin word “refluere” implies to “to flow again, to recede” and this pretty much sums up what takes place internally when experiencing acid reflux. If someone suffers from this condition, the acids in the stomach are pushed up to the oesophagus, creating pain. You’ll find plenty of causes for acid reflux, for example, exercising and heading to bed too quickly following a meal. However, the greatest culprit behind this situation may be the food you eat. Since food itself is often a significant contributor towards an individual developing this issue or aggravating it, it’s a good idea to look at what varieties of food can cause acid reflux so you can avoid them. When it comes to foods that should be avoided with acid reflux, the checklist, sadly, is lengthy and complicated. Whilst certain sorts of food may be consumed in moderation, various other ones may well need to be eliminated entirely from your diet. The types of food we will talk about here are in no way a definitive list, and their effects on acid reflux will vary from person to person. In some cases, some of the following foods may have no affected whatsoever on your condition even though others may well aggravate it significantly. Certain types of fruit top our listing because of their acidity. Those fruits which contain high concentrations of citric acid, for example oranges and lemons, are common culprits. And this includes food products that are made from them as well. Thus orange juice and lemonade will now be on your list of beverages to avoid in order preventing acid reflux. Other fruits that need to be avoided are tomatoes, cranberries and grapefruit. Foods that are high in fat are next on the list; this includes French fries, salad dressings and creams. If it contains an excessive amount of fat then it will likely contribute to acid reflux. This of course will include many of your favourite foods, but you can experiment with them in moderation and figure out which ones actually affect you. This will enable you to enjoy at least a few of the dishes and treats which you would otherwise have to cut off your eating plan. Other types of food that can lead to acid reflux are those that are obviously acidic, particularly those that contain vinegar. This will include a range of pickled delicacies. You will also need to watch out for certain meats. Essentially, this includes the high fat cuts, ground beef, and even lean cuts that have been deep fried. You might also need to eliminate dairy products from your diet. Common triggers include sour cream, ice cream, milk shakes and cottage cheese. Acid Reflux arises when the tube that you utilize to intake the food from the throat to stomach is not tough enough to handle the acid. The food you have consumed is digested by the stomach with the aid of an acid created and stored by it. The stomach walls are formed strong enough to accumulate that acid without causing damage. Thus, when all of these fail, it can be considered an acid reflux cause. For indefinite reasons, when acid flows back into the oesophagus from stomach, it leads heartburn, which is extensively considered the primary cause. It leaves an unvarying chest burning sensation. Acid reflux normally occurs when the lower oesophageal sphincter (LES) does not work appropriately, and tolerates acid to leak upwards from the stomach to the oesophagus. Even though, we know that a damaged LES is a common cause, we are not definite why it becomes faulty. One of numerous reasons could be that pressure in the stomach rises higher than the LES can resist. Various foods have different effects on people and they can be considered as acid reflux cause. Besides, it is good to limit these foods. These comprise coffee, alcohol, spicy foods, fatty foods, chocolate, dairy products and fruit juices. Smoking increases the acid within the stomach. This may cause burning in the chest and food pipe. 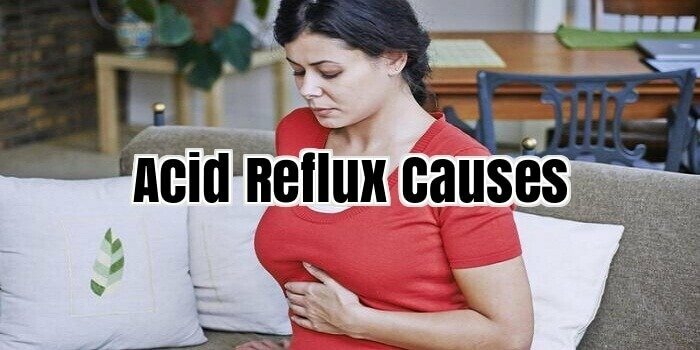 Excessive eating is also an acid reflux cause. The acid formed to break down the excess food increases and some of it moves back into the food pipe. Also, eating hefty amounts of food before going to bed is not advised. It is better to maintain the head in a raised position while sleeping. Give your body at least two hours to assimilate your food properly. Never lie down right away after eating a large meal. Eat smaller fractions of food every mail. Obesity otherwise called overweight, can also increase the irregular pressure. If you are obese, lessen the amount of food that you eat at each meal. Eat only after you feel undisturbed. Keep away from alcoholic drinks which diminish the digestive power of the stomach. Other foods that can be a cause take in citrus fruits such as limes, lemons, grapefruits, tomatoes and oranges. Several spices that you put in to your foods can cause heartburn and be an acid reflux cause. For example, peppers and chilli peppers can infuriate the lining of the food pipe. Acid reflux can last for a few months or longer if not managed. Drug treatment is often only required for a short time even if it may have to be repeated since some symptoms may reoccur. The natural cures for acid reflux are the likeliest alternatives to drugs and surgery since they are economical and have no side effects. Chew a bit of ginger or boil this and drink as tea. Eat a portion of papaya since it contains digestive enzymes that speed up the digestive process, supportive in eliminating heartburn. The oil in almonds aids neutralizes the acidity in the stomach. Eat at least 6 almonds to alleviate the gas pains. Try all of these and be sure to wipe out the acid reflux cause. You may have heard of acid reflux or heartburn. You may also have experienced the symptoms of the condition from time to time. However, have you ever sat back and looked into what might be causing the problem? Acid reflux causes could be the answer to maintaining your condition and the more you know, the easier it will be to handle. It is all very good and well taking medicated treatments for acid reflux but at the end of the day, these are generally only meant to be used in the short term and long term usage could cause to further problems. It is not unheard of for a patient to become dependent on this medication in order to combat the condition but it is a much better idea to look at the acid reflux causes to try and prevent the symptoms rather than stop them once they have started. Various foods have been well known for being acid reflux causes and by learning the foods that can cause this condition you can then avoid them and potentially avoid the symptoms. Among the foods that you may wish to avoid, you will find the following: • Caffeinated products. Unfortunately, for most of us, this means tea, coffee and even chocolate. However, all of these things are well known for relaxing the LES valve which is designed to stop the acid reflux. So, next time you go shopping, try looking for decaffeinated drinks and avoiding chocolate! (This is easier to get used to with practice!) • Again, another downfall to this list is that fatty foods are known to be acid reflux causes. There are a number of reasons why these foods should be avoided and one of the main things is that they massively slow down the digestive process so food is contained within the stomach for longer. In turn this leads to acid escaping and the familiar symptoms start to bubble up. As you can see, the acid reflux causes will very often be things that you may not have previously thought possible but generally, the causes are easy to change and therefore preventing the acid reflux itself becomes less of a problem.